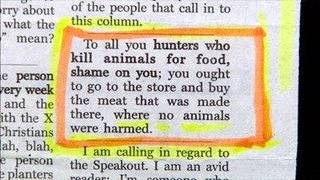 Shame on all you hunters. Shame, because everyone knows it comes from the local piggly wiggly. So Cass Sunstein thinks my dog should have the right to sue me. He feels that hunting is wrong and that my 2nd Amendment rights apply to the army only. To that I'll be signing up for my Missouri Hunter Safety Education Course. Now, to find a decent used 30-06. I'm really looking forward to this November. Remember folks, some animals are more equal than others.